Ye can dounload the clip or dounload a player tae play the clip in yer brouser. 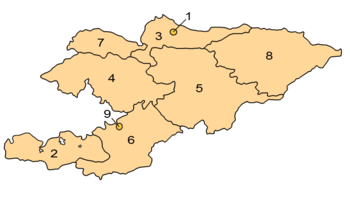 Kyrgyzstan (Inglis pronunciation: /ˈkɜrɡɪstɑːn/ KUR-gi-stahn; Kyrgyz: Кыргызстан [qɯrʁɯzstɑ́n]; Roushie: Кыргызстан‎ [kɨrɡɨsˈtan]), offeecially the Kyrgyz Republic is ane o the sax independent Turkic states thegither wi Turkey, Azerbaijan, Turkmenistan, Uzbekistan an Kazakhstan. Locatit in Central Asie, landlockt an mountainous, Kyrgyzstan is bordered bi Kazakhstan tae the north, Uzbekistan tae the wast, Tajikistan tae the soothwast an Fowkrepublic o Cheenae tae the east. Its caipital an lairgest ceety is Bishkek. Bi extension, Kyrgyz is an aa thought tae mean "unconquerable" or "undefeatable". The 40-ray sun on the banner o Kyrgyzstan is a reference tae those same fowertie tribes an the graphical element in the sun's center depicts the wooden croun o a yurt -- a portable dwellin traditionally uised bi nomads in the steppes o Central Asie. Kyrgyzstan is ane o the twa umwhile Soviet republics in Central Asie tae retain Roushie as an offeecial leid (Kazakhstan is the ither). It addit the Kyrgyz leid tae become an offeecially bilingual kintra in September 1991. This bilingualism wis intendit tae signal tae the ethnic Roushies that they wur walcome in the new independent state, in an effort tae avoid a brain drain. Each province comprises a number o destricts (raions), admeenistered bi govrenment-appointit offeecials (akim). Rural communities (ayıl ökmötü), consistin o up tae 20 sma settlements, hae their awn electit mayors an cooncils. This page wis hintmaist chynged oan 02:16, 25 August 2015.